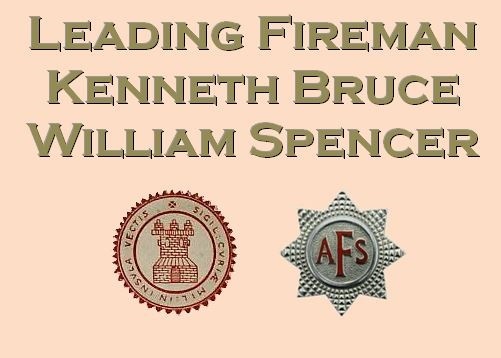 Fireman Kenneth Bruce William Spencer passed away on 26 October 1961 aged 38. He was born in Ventnor on 22 August 1923 to his father Charles Edward John Spencer and his mother Rose Kate 'Kitty' (nee Nobbs). His father's brother, Percy Robert Spencer, was the long-time Chief Officer of the pre-WW2 Ventnor Fire Brigade who continued to serve throughout the war with the National Fire Service despite being demoted under the nationalised regime to Leading Fireman. Together with his wife Elsie Lilian (nee Tolmie), who he married in 1947, they were publicans of the Central Tap in Ventnor's High Street. The couple had at least one son. When Kenneth decided to become a fireman isn't known but at the time of his sudden and unexpected death he was a Leading Fireman in Ventnor's detachment of the post-WW2 Auxiliary Fire Service which was reformed in 1948. His funeral at St Catherine's Church on 31 October was well attended and his coffin was born to the grave by three members of the AFS and three of Ventnor's retained firemen. Chief Fire Officer Richard Fitzmaurice Sullivan, Station Officer Pitts and several firemen of both Ventnor Fire Station and the AFS detachment attended. Rest in peace Leading Fireman Spencer.